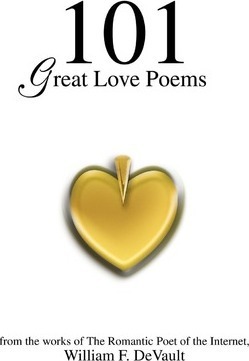 Taken from life experiences, and providing insight and expression to the needs, cravings and desires we all share, William F. DeVault gives us over one hundred extraordinary poems of love. The Romantic Poet of the Internet takes us into the mind and heart of everyone who has ever sought or felt love, and gives us words worthy of remembering and motivating us to express our souls' passions. Whether you are looking for an emotional rush, a poem that expresses feelings you can't find the words for, or a reference book for inspiring yourself and others, there is no better guide to gates of the City of Legends than the Internet's and America's master poet. Fully indexed by first lines, and featuring a variety of styles and states of the heart, this is a perfect gift to a lover, or for anyone who thinks that real poetry and eloquence is past its prime. For, here is the prime of love poetry.